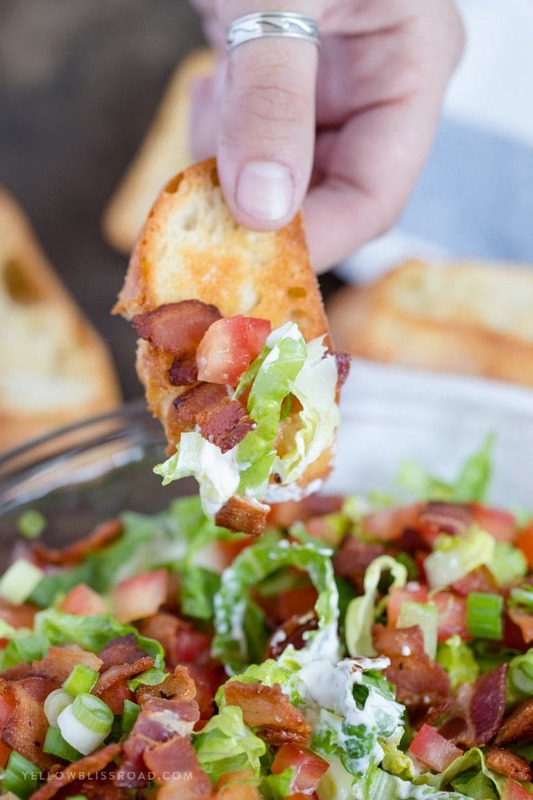 My BLT Dip served with crispy crostini for dipping is a delicious combination of flavors from the classic American sandwich favorite. Did you know that the famous BLT sandwich was not actually named after it’s ingredients (Bacon Lettuce and Tomato)? It’s true! Well, it could be true. I had never thought twice about why the sandwich is bacon, lettuce, tomato and not lettuce first or tomato first. But now I won’t be able to eat one of those sandwiches without a little wordplay. Or this BLT Dip. 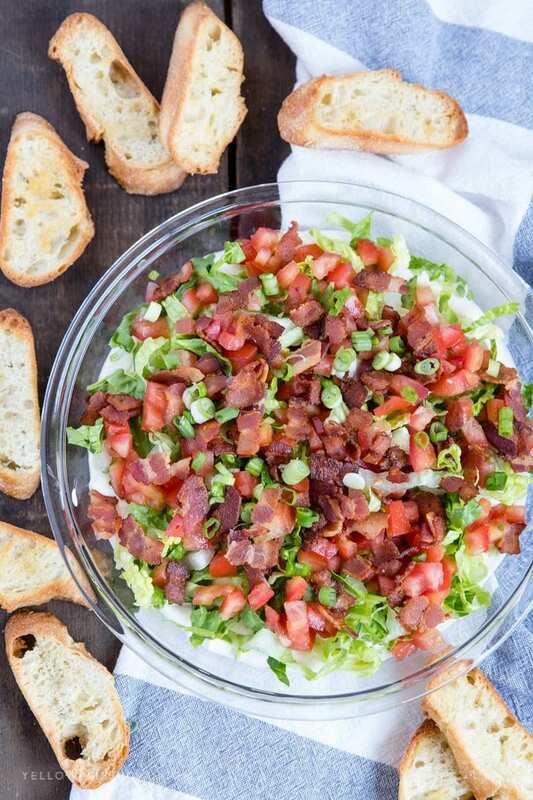 This super creamy BLT Dip is a surprise family favorite. My 14 year old, who was helping me the day I photographed this recipe, is a self-proclaimed mayonnaise and sour cream hater. I know, I think she’s cray-cray too. But she was helping me make some recipes and with some food photography one day over winter break so I told her she was required to taste everything. It was in her job description. She reluctantly agreed…then proceeded to eat nearly half of this entire pan of dip. That’s how good it is. 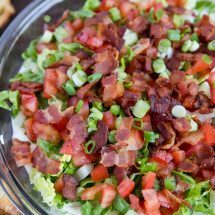 My “famous” BLT Dip is a pretty simple mixture of cream cheese, mayo and sour cream for the base, with added flavors of seasoned salt and garlic. 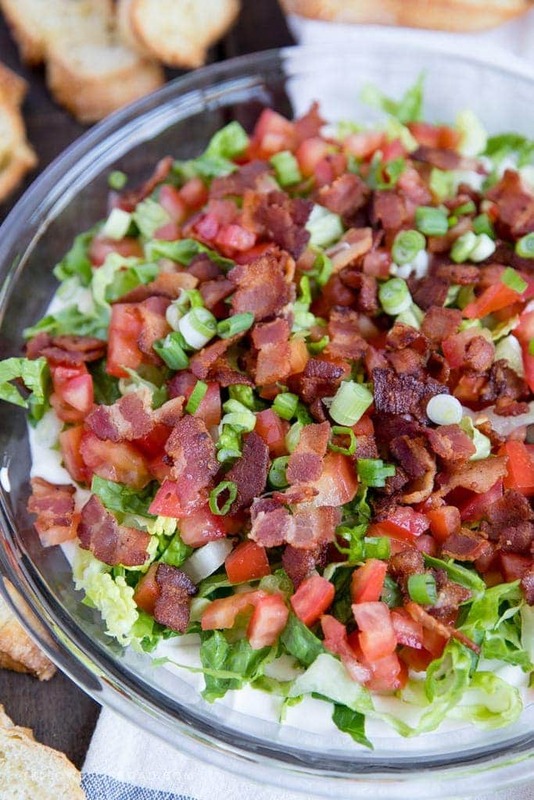 The toppings for the dip are lots of shredded lettuce, diced tomatoes, and of course bacon. For fun you could even mix some of the bacon in with the cream cheese base for an extra bacon-y surprise. 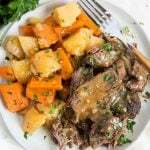 I also added sliced green onions which add a little heat to all the creamy, salty flavors. You could make this dip in just about any small dish you like, but I think a pie plate is great, especially a clear glass one like this one. (aff) The clear glass allows the dipper to see the creamy white dip below all of that crunchy goodness on top. I’d also recommend serving with crostini; just toast some sliced baguette in the oven at 375 for about 10 minutes or until golden brown and crunchy. Let them cool then serve them on the side of this BLT dip. Your guests will feel just like they’re eating that classic sandwich when they dive in with a piece of toasted bread – but way less messy! My BLT Dip served with cripsy crostini for dipping is a delicious combination of flavors from the classic American sandwich favorite. In a medium sized bowl and with an electric mixer, combine cream cheese, mayonnaise and sour cream until smooth. 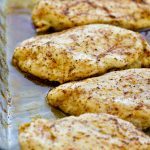 Mix in seasoned salt and garlic powder. Spread cream cheese mixture into a small, flat bottomed dish (like an 8” pie pan). Chill until ready to serve. 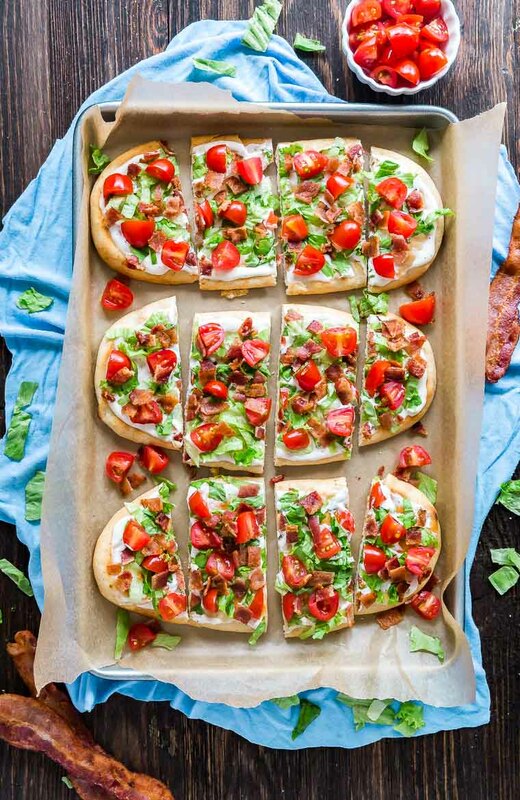 Top with lettuce, tomatoes, bacon and green onions. 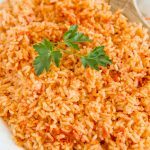 Serve immediately and with crackers or chips for dipping. I recommend using a heartier lettuce, like romaine or iceberg, as softer lettuces can brown or wilt easily. 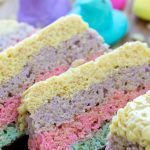 Do you bake it at all?? Hi Carole, no baking for this dip! It’s just a cold dip. 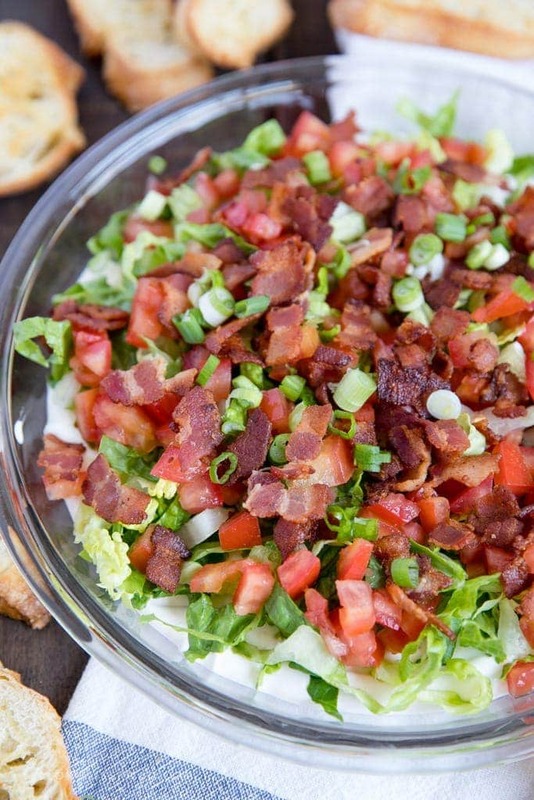 Love BLTs, so can’t wait to make this dip. Thanks! This looks like the next snack I’ll fix my Grandson , He would live on bacon I if I let him, Would turkey bacon do as well. 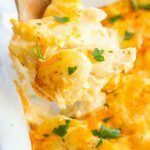 This dip is easy and WONDERFUL. It honestly tastes like you are eating a BLT…only better. Hi Kristin I can’t wait to make this dip of yours. It looks so good. And easy. 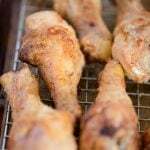 One question when u do the bread in the oven do u just put the bread pin plain or w oil or butter on it? Made the BLT Ranch Flatbread this weekend. 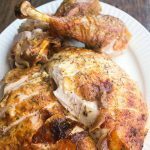 So incredibly easy to make and utterly delicious!!!! 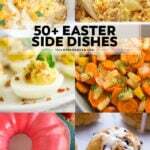 Definitely will be making this again!